Everybody knows what it feels like to be frustrated. It’s as if the entire world throws up roadblocks to bother you. 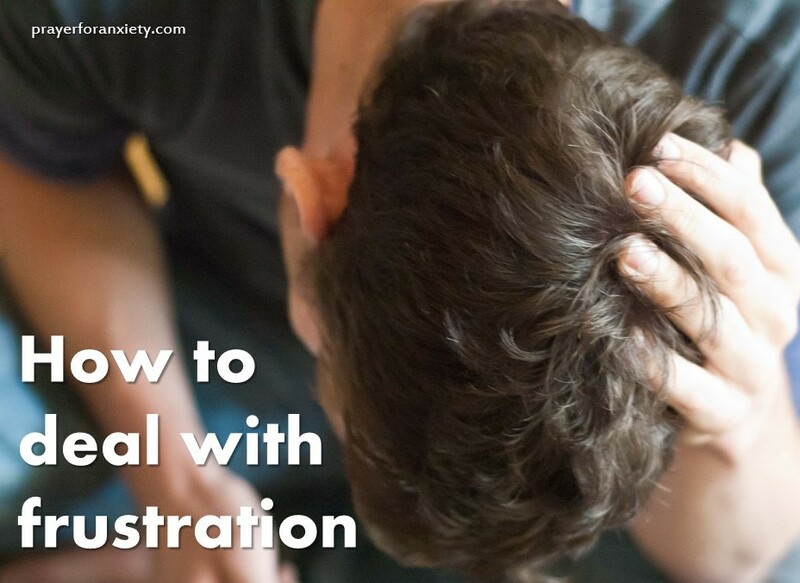 Here you’ll learn how to deal with frustration, and the best methods might surprise you. At Prayer for Anxiety, we examine all things through the lens of faith. What Frustrates You And Why? Some causes of frustration might be that you had it easy growing up, but now, with more responsibility, things are not as simple as before. Or perhaps you lived in a very controlled environment and were influenced by negative reactions to frustration. Finally, an environment of neglect may have caused an ongoing sensation of not having your needs met. Stop and identify the things that cause you frustration. Do you get annoyed more with circumstances or people? Or maybe your own limitations cause dissatisfaction. Take a good look at your frustrations, then answer this question honestly: Why do these things or people bother you so much? Many times we get caught in a cycle which begins with feelings of frustration followed by our own negative reactions. Then we get frustrated with ourselves which magnifies the negativity until the next difficult moment comes along. This process leaves open wounds that become more and more sensitive with each subsequent event. Later we will look at a more faith based perspective, but here are some ways that you can try to deal with frustration. Try not to respond if your too angry. Talk later. Seek to be as sincere as possible but understanding as well. Meditate upon these suggestions. Which seem to fit best where you find frustration? Things never go my way. I’m always unlucky. He/she never sees things my way. He/she deserves punishment of some kind. It’s not fair that I have to deal with this person/situation. I always make a mess of things. Do you see a common thread here? All these statements deal with some sort of finality or condemnation. As the devil likes it, there’s no room for hope. Instead, the evil one offers the idea that control will solve everything. But he also knows that we can’t possibly control the world so we are left with the despair of frustration. Patience is power. This realization can help you greatly when you look back at the statements of condemnation. Instead of letting someone or something get the best of you, you can take a step back to a position where you are truly in control. This does not mean that you won’t feel strong emotions, but you can be in command of them. Even though patience is a powerful ally, a deeper meaning can be found when you assume a position of love and service. When things don’t go your way, offer your disappointment up to God instead of getting mad. Or when someone attacks you, listen to their heart as it is crying out for help. It might be ugly, but the reality is that their soul suffers from a lack of peace. Resist the temptation to add more hurt and be an instrument of healing instead. Dear Lord, free me and heal me of my frustrations and the wounds they have caused. Let me have a merciful heart like yours. Let me serve those that frustrate and attack me. Allow me to be able to see what they really need so I can then offer them hope and peace. Make me strong in your mercy and love. In Jesus’ name, Amen. This doesn’t mean that you let people walk all over you. Strength from patience, love and mercy are infinitely superior than trying to be in control. Instead you react reasonably and with wisdom. You find solutions instead of looking for a fight. The threat of despair is dispersed with the Spirit of truth. Some things can only be changed by God’s grace. We are stubborn creatures by nature. Remember, God’s Spirit is the power by which Jesus was resurrected. Trust in God’s ability to transform you – this inspires others to change. If we give of ourselves then we tap into something miraculous. It takes time, dedication and humility, but love always triumphs over control. Go to the Lord frequently and faithfully, especially when you make a mistake. When you see how frustrating you can be to others, Jesus pours out his forgiveness upon you. His mercy fills you and overflows abundantly bringing freedom and truth to all those around you.